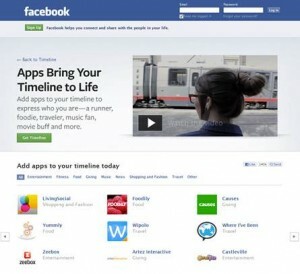 Social networking giant Facebook launched Facebook Timeline last December as a new way for people to share their (entire) lives online. Perhaps people are just resistant to any kind of change; there are entire Facebook groups dedicated to sharing their hate for Timeline. But for those of you who actually like or don’t mind it, there are various apps you can use to improve your Timeline profile. If you’ve got the travel bug in you (and would like your friends to know it), TripAdvisor‘s ‘Timeline-enabled Cities I’ve Visited’ app lets you pin destinations you’ve traveled to on your virtual travel map, and display your map and other travel stats about yourself on your timeline. You can share past trips, as well as get advice on upcoming trips and discover new places to visit from your friends and the 20 million travelers who have pinned more than 1.5 billion cities to their own maps. Here’s an app that’s been getting into the news quite a bit (although not all of it good) – Pinterest is a virtual pinboard where you can collect visual inspiration from around the web and pin it to themed ‘boards’. 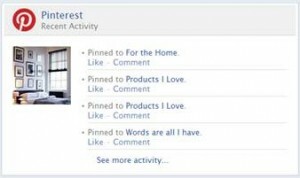 With its new Facebook app, your friends can see what your ‘pins’ directly on your Timeline. And how can we forget games? If you’ve been playing Words With Friends on your iOS device, the Words With Friends app allows you to share all your impressive word constructions achieved during your games on your timeline. Just too bad you can’t play this word building, triple score seeking, chat bubble-sending game directly on Facebook (yet). If you’re a fitness fanatic, you’ll probably dig this – RunKeeper (which, ahem, runs on various mobile operating systems) uses GPS to track your fitness activities, including distance, time, pace, calories, heart rate, and path traveled. It helps you log your different workouts and track how your fitness regime is going, and then shares your running habits on your timeline to make your sedentary friends jealous. Yes, I hate you already. 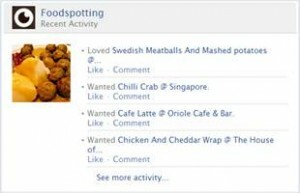 For the foodies amongst us – Foodspotting is a great visual way to share with your friends about good food and where to find it. You can bookmark foods you want to try by clicking (“Want it!”), or vote up foods you’ve tried and loved (“Nom it!”). You may regret seeing this when you’re up late at night and feeling peckish, though!